IDEC presents the HG1F, the latest operator interface in the IDEC SmartTouch family in a super bright compact design. Featuring a 4.6-inch LCD screen, HG1F incorporates all the features of large touchscreens in a small form factor that fits into tight spaces as well as tight budgets. HG1F touchscreens have a super-slim design with 35.3mm panel depth that allows their installation anywhere. 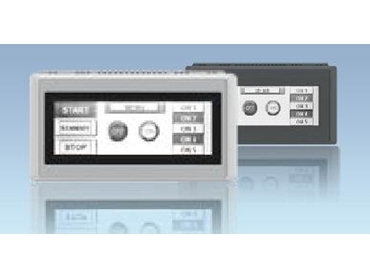 The touchscreen interfaces offer the flexibility of horizontal or vertical mounting to suit specific requirements with the programming software supporting both orientations. HG1F 4.6” LCD screens are programmable with WindO/I-NV2, a Windows-based software that walks the user through easy configuration of images and workspace. Screen creation in the touch panels is fast and easy through simple drag and drop functions. Previewing and editing functions are handled through WindO/I-NV2’s extremely user-friendly interface. The software comes with built-in PLC drivers for the user’s convenience and a library of over 5000 images to help create cutting edge graphical screens.